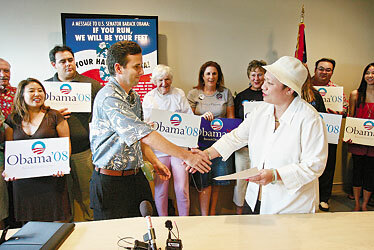 Brian Schatz, left, shook hands with the executive director of the Democratic Party in Hawaii, Florence Kong Kee, yesterday at party headquarters after presenting her with a check for $2,500 to add U.S. Sen. Barack Obama's name to the ballot for the state's Feb. 19 Democratic caucus vote. Hawaii-born presidential hopeful Barack Obama officially added his name to the ballot for the state's Feb. 19 Democratic caucus vote. Volunteers with Obama's Hawaii campaign delivered the $2,500 filing fee to Democratic Party headquarters yesterday. "We are very excited," said Florence Kong Kee, the party's executive director. "We just can't wait, as so many new people have been joining the party and getting involved." New York Sen. Hillary Rodham Clinton and former North Carolina Sen. John Edwards already have filed to be on the Hawaii ballot. Kong Kee said she also has received word that Delaware Sen. Joe Biden, New Mexico Gov. Bill Richardson and Ohio Rep. Dennis Kucinich plan to file. Obama, who traditionally spends the holidays in Hawaii with family, will not do so this year, choosing instead to focus on the Jan. 3 Iowa Caucuses, the first key vote of the 2008 campaign. "He's focusing singularly on Jan. 3 in Iowa," said Hawaii campaign spokesman Brian Schatz. A CNN-Opinion Research Corp. poll released yesterday showed Obama, Clinton and Edwards in a statistical tie among likely voters in Iowa. Obama, the junior senator from Illinois and a 1979 Punahou graduate, has not been to Hawaii since announcing his presidential bid earlier this year. According to the Federal Election Commission, his campaign raised $335,363 in Hawaii -- the most among Democrats -- as of Sept. 30, the most recent reporting date.